Richard is in the Woodhead leadmine census of 1841 as being aged 11 and living there with his parents, John, an overseer, his mother and two older brothers oth leadminers. There is also included a certificate for the marriage of James Park to Marion Ferguson on 24 August 1860 and a copy of their son Adam's birth certificate on 11 September 1860. 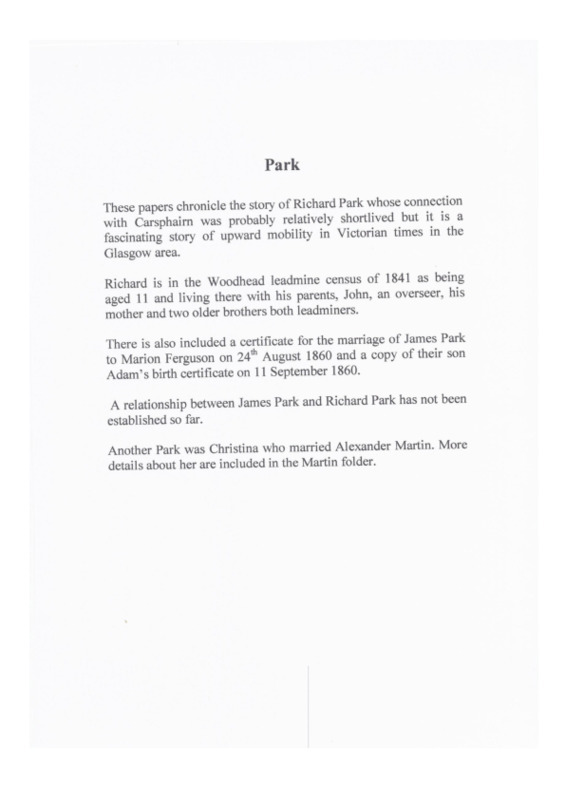 A relationship between James Park and Richard Park has not been established so far. Another Park was Christina who married Alexander Martin. More details about her are included in the Martin Family History. IS, “Park Family History,” Carsphairn Archive, accessed April 20, 2019, http://carsphairn.org/CarsphairnArchive/items/show/105.